Today, I have SCARS author Cheryl Rainfield here to answer some questions about her recent breathtaking recent about a teenage girl who is the victim of child sexual abuse and who cuts as her method of coping. AGA: What was the biggest factor in your decision to write this story, given it's autobiographical nature? CR: Two things that drove me to write SCARS and try to get it published we re my need to write and to be heard through writing, and my need to reach others. SCARS is a work of fiction, but I definitely drew on some of my own experiences and my emotional truth to make the book stronger. Working on the book also became a piece of my healing. As a child and teen, I was always looking for reflections of my own experiences in books I read, to know that I wasn't alone. There was a lot I identified with in books, but I would have found it even more helpful if I'd found a book that showed me I wasn't alone--or crazy--for what I was going through and remembering. I hope to give that to others. I also hope to reach people who haven't directly experienced sexual abuse or self-harm, but might gain a little more insight and empathy through reading a story about it. I think that sometimes it can be easier to read and learn from fiction than non-fiction, especially if the story is well written. So that's what I hope to provide. I've heard from a few readers already who said Scars helped them to understand self-harm when they couldn't understand it before. I'm so glad about that! AGA: What was the hardest part of this book to write? CR: It's probably not what you'd think it was. The hardest part for me to write was the bits of happiness. I didn't know what happiness was. I didn't really experience true happiness, other than fleeting moments coursed with worry, until very recently. What I knew inside out was pain, trau ma, and terror. Those things came easily. AGA: How long did this book take to write, start to finish? CR: It depends on what you mean by "finished." I write my first drafts quickly--so it probably took me a few months to write. But then I edit the book multiple times to refine it and get it right. I edited SCARS about 40 times over almost a ten-year period (when I was also working on other books) before my publisher, WestSide Books, accepted it--and then we edited it a few more times. AGA: If you could pair Kendra with any character from any book, what would your pick be? CR: Do you mean pairing in terms of a romantic relationship, or a relationship in general? For a romantic relationship, I'd love to pair her with a combination of Alanna (Alanna: The First Adventure by Tamora Pierce) for strength and courage and pluck; Anne (Anne of Green Gables by L M Montgomery) for creativity, sensitivity, and dreaming; and Annie (Annie on My Mind by Nancy Garden) for sexual orientation and attraction. AGA: Did you know how this book would end before you started writing or did it form as you went? CR: I knew in a general sense, when I started writing, how I wanted the book to end. I knew I wanted a happy ending, and I knew I wanted Kendra to get safe and to heal. I"ve experienced too much unhappiness and pain in my life to want to go through--or put anyone else through--an unhappy ending, especially after emotionally investing in an entire book. And healing is so important to me; I wanted to show that development through the book (and, of course, character development), and definitely have that strong in the ending. The specific ending changed and refined over the edits and the years, as the rest of the story changed. But I always had Kendra find happiness in most of the ways she did. AGA: Is there anything else you'd like to add? CR: If you have a dream, follow it. Go after it. Don't give up. If you don't give up--even if it takes you years--it's likely you'll get there. That happened to me, just as I felt like giving up (but couldn't). So keep holding on to your dreams. Thank you, Cheryl, for stopping by and congratulations on finally getting this book out there. Off to add this one to my list of wants - sounds amazing, wonderful interview! Thanks! Fabulous Interview! 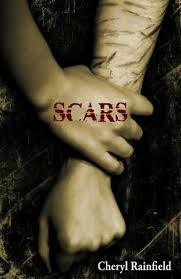 I had no idea Scars was partly autobiographical. I'll definitely need to read this soon! I am definitely wanting to read this one. A friend is lending it to me. I have read good and OK reviews so I want to judge for myself. Great teaser.